For a while now it has felt as though Winnie the Pooh is everywhere in some form or another. It all started one day when I was walking to the Prakanong market and as I crossed the canal overbridge I looked down and found a new resident on the ferry dock. 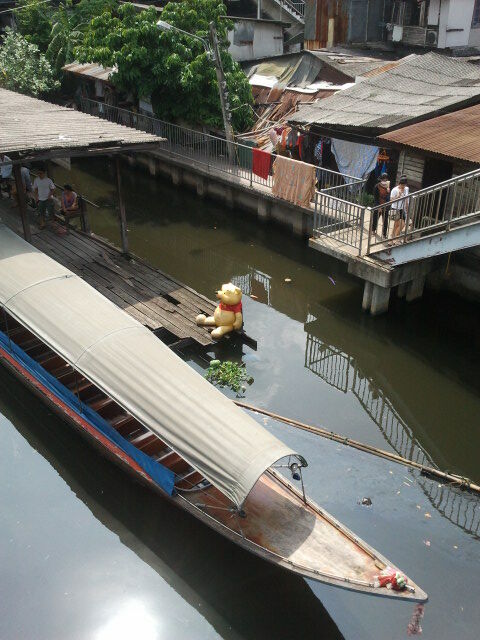 Since that day I have noticed Winnie the Pooh in other locations too. 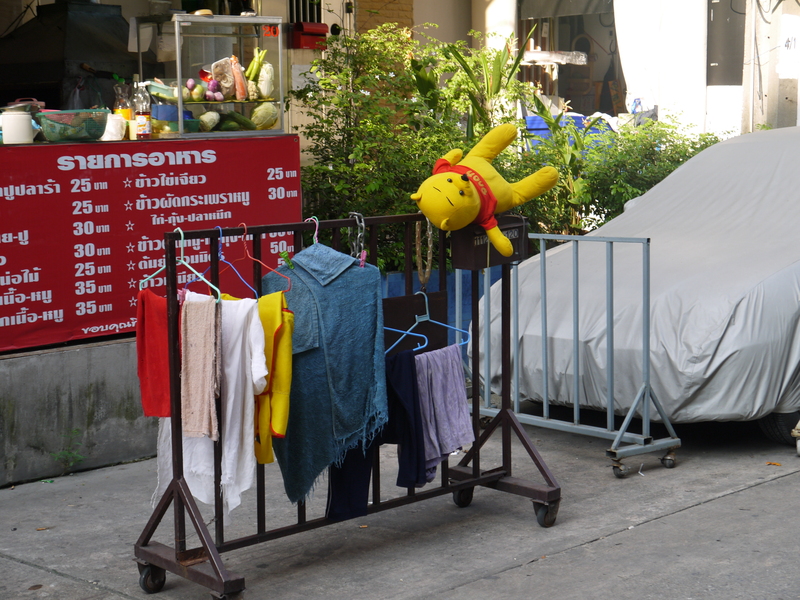 Hanging out with the washing while it dries… maybe he just had a bath? In a shop window patiently waiting for someone to take him home. Underneath a Christmas tree with a whole bunch of siblings. On a balcony, just hanging out. 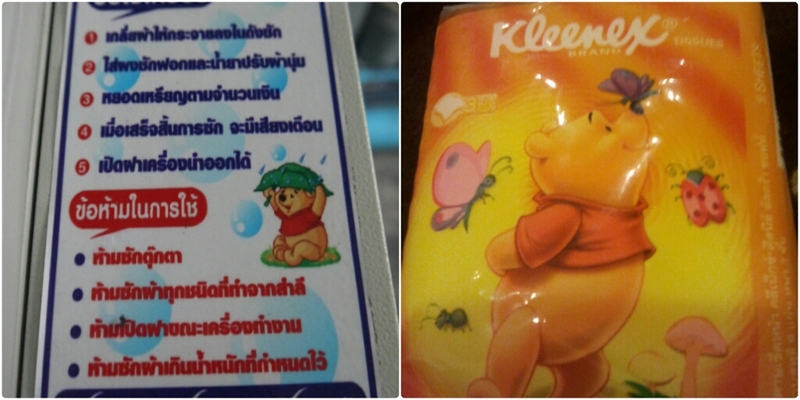 He is not only everywhere in soft toy form but it is also common to see him pictured on other objects, such as on a bag of tissues or on the instruction panel for the washing machine at our apartment. 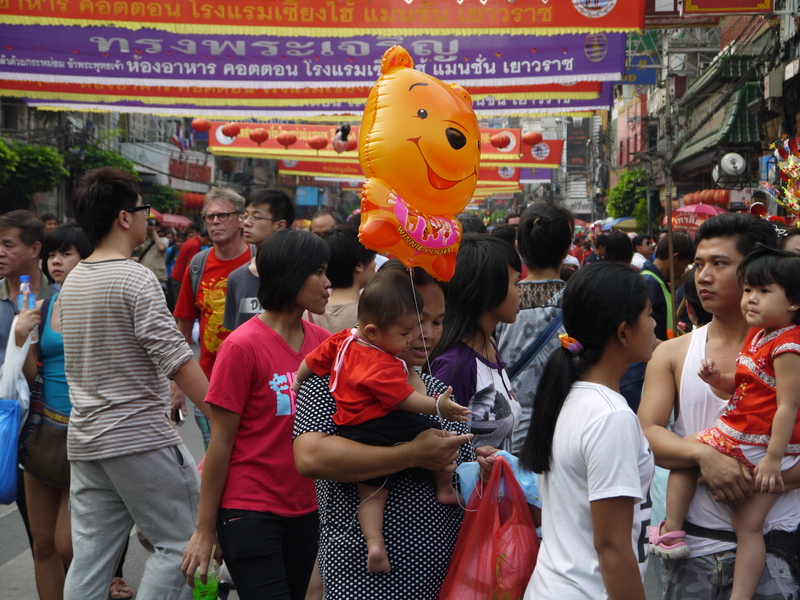 Or as a balloon… here Winnie the Pooh is enjoying Chinese New Year in Chinatown, Bangkok. 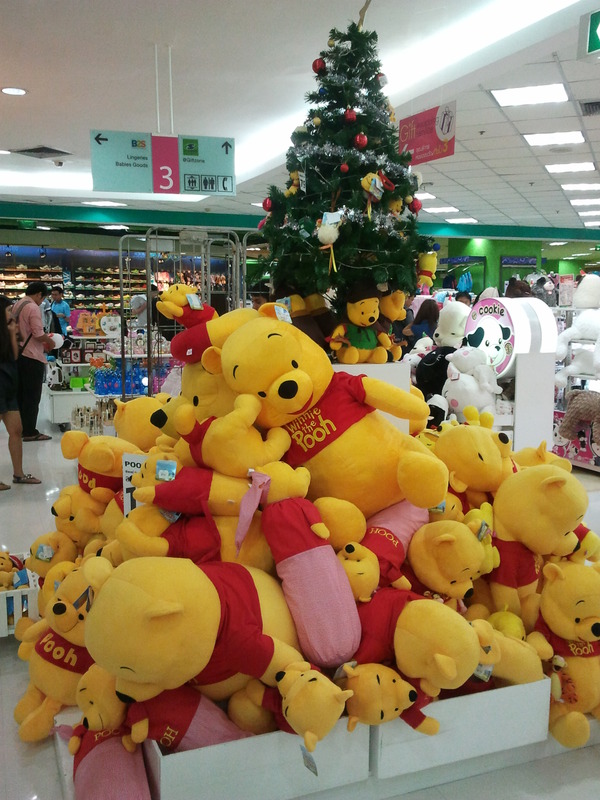 I quite enjoy seeing Winnie the Pooh everywhere and I’m sure that there will be many more places that he pops up. And if it is not Winnie the Pooh it might be Mickey or Minnie Mouse, Hello Kitty, Doraemon or one of the many other well loved cartoon characters. 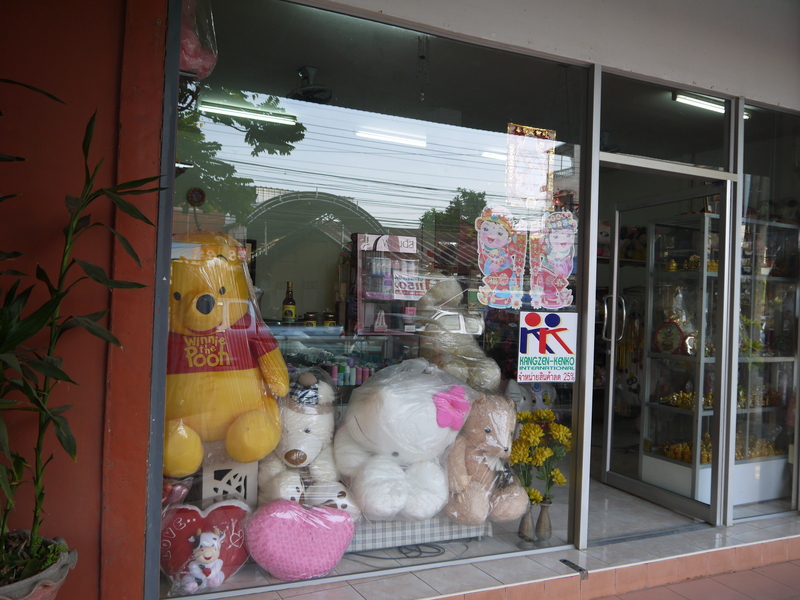 I could comment about how it seems like Thai people have an obsession with these characters but I’m not really one to talk given the huge pile of Elmo paraphernalia I collected growing up. What a shame, we seem to have missed him when we were there. I think he was most probably around but maybe it was just a little too busy for you to see him. 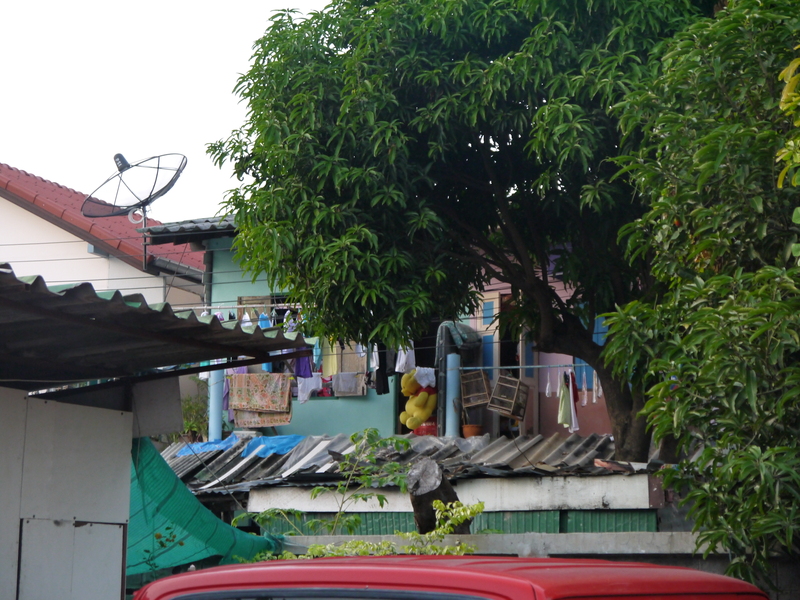 « Monday Madness – Thai lottery numbers – fixed or fate?